This is a section I refer to as DUGABO, or Down Under the Greenpoint Avenue Bridge Onramp. 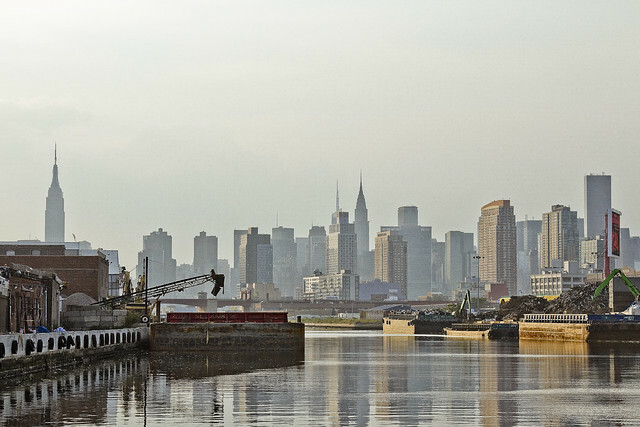 On the left side of the shot is the Allocco family’s aggregates recycling yard in Greenpoint, on the right is the SimsMetal recycling facility in Long Island City’s Blissville section. Today’s post will be taking us eastwards from DUGABO into oil country. 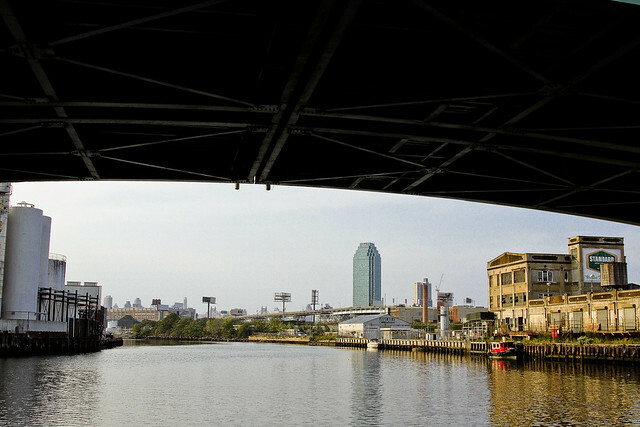 Technically speaking – all of the Brooklyn side of the Newtown Creek, from the Pulaski Bridge east to Meeker Avenue was once oil country, home to a series of Standard Oil (SOCONY) refineries and distribution facilities. The industry’s footprint in the area began to shrink as early as the 1950’s, and refining on the Creek literally stopped in the middle 1960’s. Literally “DUGABO,” the Greenpoint side on the left shows the tanks of Metro Fuel, a bio fuel company which actually performs some refinery operations in the modern day. On the Queens side, you’ll notice the Tidewater building. Tidewater was a pipeline company that challenged Standard Oil’s monopoly on shipping petroleum using the railroads. Tidewater was destroyed and taken over by Standard. The Standard Oil company then bankrupted the railroads by switching its nationwide distribution system over to pipelines rather than rail cars – despite having spent a couple of decades trying to convince Congress and everyone else that pipelines were inherently unsafe and uneconomical to operate. You’ve really got to love John D. Rockefeller. A bit further east, you’ll notice the tanks of the BP Amoco yard nearby Apollo Street in Greenpoint, which sit on part of the footprint of the Locust Hill refinery. This is roughly the dead bang center of the Greenpoint Oil Spill, the second largest such event in American History. The BP Amoco yard is a distribution hub, with its product brought in from refineries in New Jersey and beyond by articulated Tug and fuel barge combinations like the Crystal Cutler, which is pictured above. 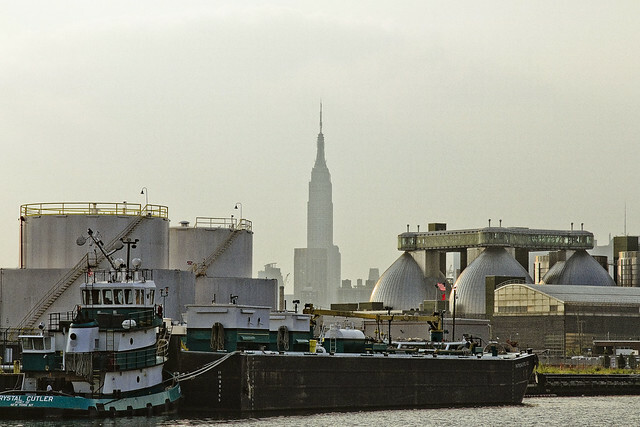 The digester eggs of the Newtown Creek Wastewater Treatment Plant are visible in the shot above as well, as is Manhattan’s iconic Empire State Building. A bit further back, that’s Meeker Avenue’s street end on the left or Brooklyn side, and Blissville’s Calvary Cemetery is just out of frame on the right. 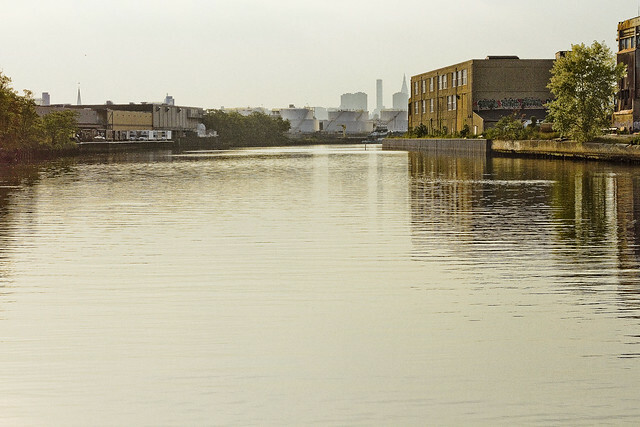 The former site of Penny Bridge, which looms large in the memory of long time residents of both boroughs, would have been right about the center of the Newtown Creek. Penny Bridge, of course, was replaced in 1939 by Robert Moses. Moses had to work around some pretty big land owners when building it. On the right hand – or Queens side of the photo – that brick building is part of the former Queens County Oil Works of Standard Oil. The Petroleum facility in Blissville is actually a bit older than Standard, believe it or not. That’s where Abraham Gesner erected the first large scale petroleum refinery in the United States, the North American Kerosene Gas Light company, which imparted to “coal oil” the brand name Kerosene. When Standard Oil bought Gesner’s operation, the company made the brand name “Kerosene” so ubiquitous that it became an American colloquialism, and it defined the product in the same way that Xerox or Kleenex define photocopies or facial tissue. Really interesting post – the sort of one where I can easily spend a whole morning recursing through all of the references and lose myself in your past posts/wikipedia. Thanks!